Some of the animals are curious about the camera, but they almost always appear relaxed. Cats are particularly curious, and if they are in the area there are many techniques that use their curiosity to bring them close to a camera. This bobcat appeared every 8 hours after I checked this camera. They say curiosity killed the cat, but there is no such saying for moose. My cameras have captured thousands of pictures of moose checking out the cameras. Mostly the cameras are set low for lynx or bobcats and therefor the photos of moose are of whiskers, long legs, and moisture on the lens from their breath. Sometimes the moose “examine” a camera by knocking it off the tree. This calf got down on her knees to examine the camera that was 6 inches of the ground. 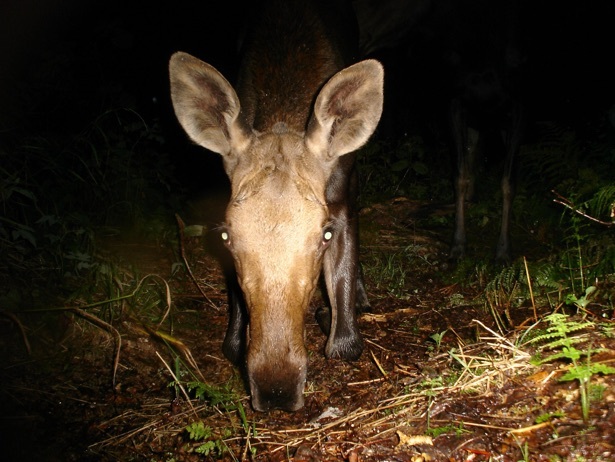 Moose, like many other animals, clearly recognize the camera as something new in their habitat, and go out of their way to examine the cameras. Animals don’t have fingers or hands to examine a camera, but they show significant intelligence in their curiosity and delicacy. A sharp image shot on Christmas day. There are few holidays for photographers, but certainly no days off for animals. Every day, even a holiday, is an opportunity to photograph something new. The geography at this site funnels all passing animals onto this log, which must be used to cross from one side to another. 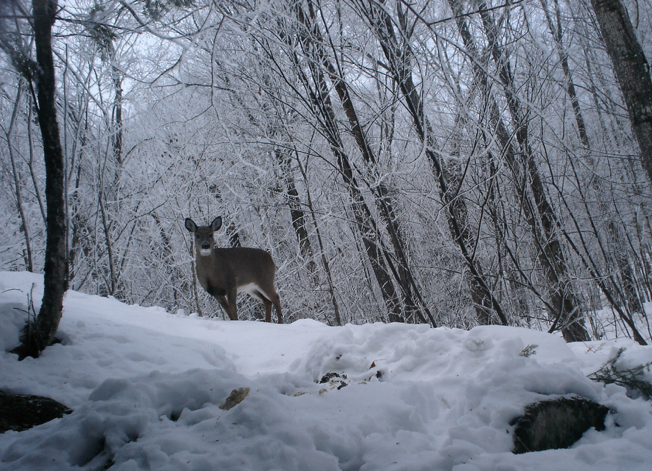 The best locations such as this site keep producing good pictures year after year because they force traveling wildlife into the same spot every time. 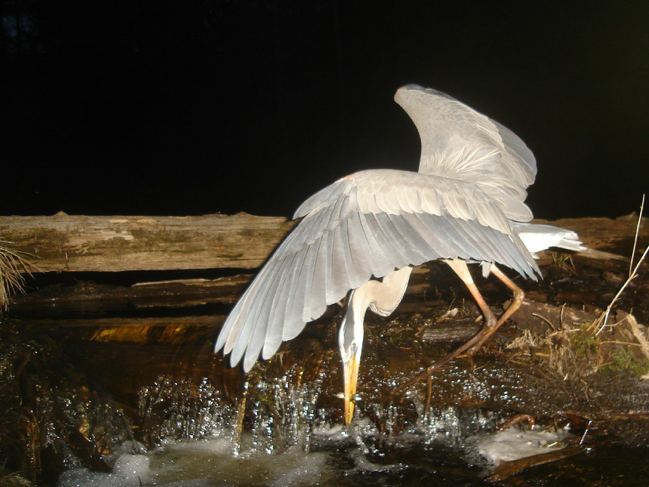 This heron was photographed fishing a school of minnows at midnight. The Lynx: The first picture of a lynx in N.H. took over 7,000 pictures and 8 months of work to capture. 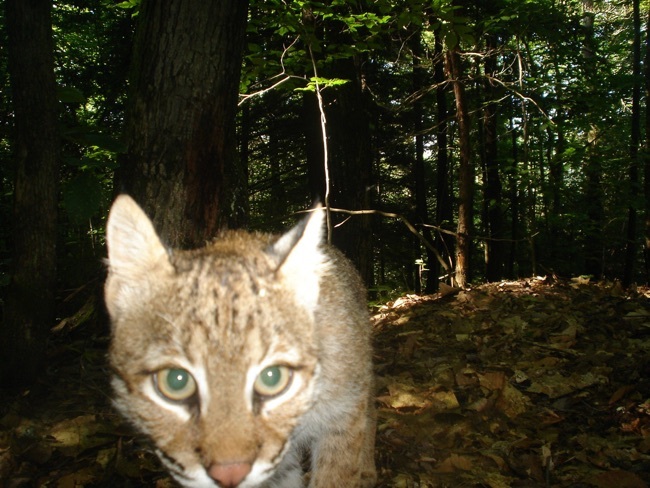 Efforts to capture a lynx on camera began at the end of July 2011 and involved miles of bushwhacking and wading through marshes and bogs to find camera locations. Lynx were known to be passing through N.H., as evidenced by tracks and a few scattered sightings. 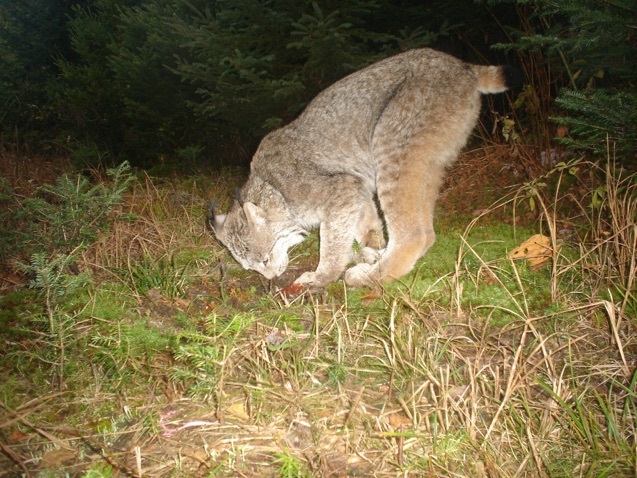 The last lynx in N.H. was road-killed in the early 1990‘s. This was one in a set of photo’s taken on October 10th at 8:15 and 8:16 am. At the time this photo was taken, no other photographs of wild lynx in N.H. existed. Efforts to photograph lynx continue to this day during all times of the year including winter camping and travel on snowmobiles during the winter months.